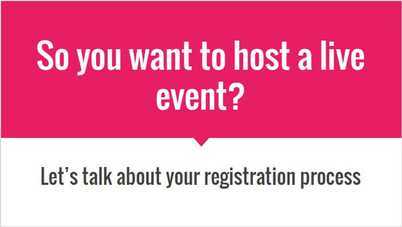 I'm working on creating a special course JUST FOR YOU to teach you [just about] everything I know about meeting & event registration as a whole (this is NOT Cvent-specific - it's EVENT-specifc!). EEK!!! ​After months of denying my GENIUS in this area, I have finally embraced it and am creating an entire course outlining as much as I can possibly get out of my head and onto paper. I know you'll find some nuggets of wisdom in here and, if nothing else, at least you'll get access to my template library after you complete the course! WANT TO KNOW WHEN I GO LIVE WITH THE COURSE? Just enter your information below and you'll be added to the list for release updates! I can't WAIT to share with you!